I loved the characters. All of them! Maya is strong willed and caring. Everyone loves her. Her BFF, Daniel, really cares for her, and I have to wonder if it’s more than that on his end. Rafe, the bad boy in school, is mysterious and, well… hot! I love the parents in this series also. They are pretty awesome, and there were quite a few laugh out loud moments between them and Maya. 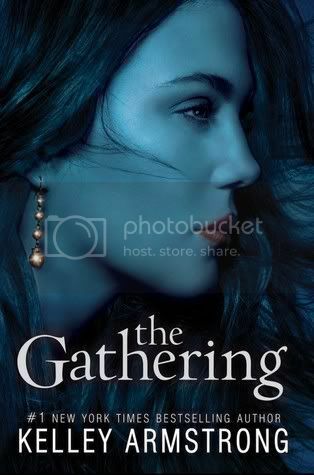 As this is a spin-off of the Darkest Powers trilogy, there are parts in The Gathering that we will know from the first series. I wish I had re-read the Darkest Powers trilogy before I read this, so that I could remember some people, as the names seem familiar, but I can’t quite put my finger on them. This could definitely be read as a standalone book as well. There is a lot of mystery, supernatural, and quite a bit of romance in this book. It’s a great start for the new trilogy, and I can’t wait to read the next two books! Sounds awesome! I read the Darkest Powers but only got to half of the second book, I didn't really enjoy that too much. I did enjoy The Summoning though, so I think I'll try and buy this sometime, see if it's as good. Hey Christy, nice review...I just finsihed reading all three in the darkest powers series about a month back and read them in part because this spin-off series sounded so interesting. Quick question...is there a huge cliffhanger at the end of this one like there was in the first book of the darkest powers series? I am so glad you liked this book as well. Maya's parents really are amazing. I am anxiously awaiting the next book! Great review. So I should read the Darkest Power trilogy before this one then? I am waiting on my library to get this one, I already have it on hold. Thanks for linking the trailer, I have not seen it and it really makes me more excited for the book! Great review. I'm very interested in reading Kelley Armstrong. I've been hearing so much about this book, but I may try her other series first. Ooh, I've been waiting for this one since I first discovered via a giveaway on Goodreads. The cover is goooorgeous and reading this review just reminds me how intrigued I am every time I see the cover. Library hold done! Thanks guys for stopping by! This series is definitely awesome. If you haven't read it yet, you should! @Yaseena- This does have a cliffhanger ending. It's not too bad though! This book is totally going on my wishlist. Glad to know I can read it as a standalone. But I'll check out the other books. I'm so happy to read you enjoyed this one even more than the Darkest Powers trilogy! I agree it was a fantastic series and I can't wait to jump into this new one. Thanks!